Hard Metal and Noga have been partners for many years. This acknowledged world leader in Hand Deburring, Holding and Cooling Systems supplies a range of quality products that compliment a portfolio in metal machining and finishing. 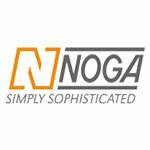 We are proud to stock a selection of popular Noga tools. Noga holders have a surprisingly broad appeal and have found interesting markets in the medical, photography, light & sound industries and more! Company profile Noga Engineering was founded in 1980 by Gustav Hirsch and his two sons Neft and Shuli. Gustav was the founder of the cutting tool industry of Israel and is a household name in the world of metal removal.